All Prices Include Parts & Labour. Accidents happen. If you have backed into your garage door with your car or have left something in the path of a moving door, this could happen. Do not attempt to fix the springs they could still have Extreme High Tension on them which could result in serious injury. Stay clear of the door and call METRO EAST GARAGE DOORS for an appointment. Our staff is available to help you solve your garage door needs. We our fully certified to help in this situation. 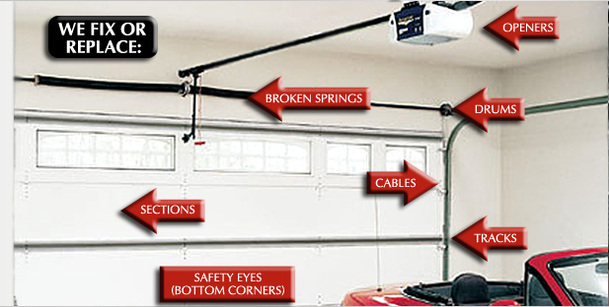 If you have a garage door that has been damaged due to an accident or to storm damage. Call METRO EAST GARAGE DOORS today and we can help you get your door replaced quickly. We are METRO EAST GARAGE DOORS experts. Family Owned and with over 20 years experience we are fully qualified to service all you Garage Door needs.